Leicester Baptist Church has been faithfully proclaiming the gospel in Leicester since the 1980’s. Leicester is an independent baptist church that is committed to the authority and power of the word of God to change lives. 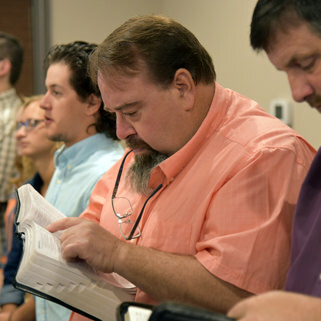 Independent baptists churches believe that the Bible is the church’s final authority–not a person or preacher or organization. 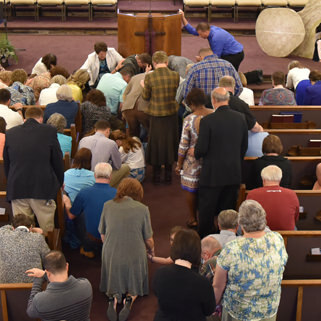 Brother Chad Ellege was called to pastor LBC in the fall of 2012, and the church is excited about the road ahead as the Lord uses Leicester Baptist to see people saved, grown in the Lord, and commissioned for His service. Our doctrinal statement is available here. If you have any questions, please be sure to let us know. We would be happy to answer any questions you might have. Membership at Leicester Baptist Church: Call with any questions or to make an appointment with our pastor about membership. (828) 515-1611. By Baptism: for a person who has been saved by accepting Jesus Christ as Lord and Savior and desires to obey Christ by being scripturally baptized by immersion. By Letter from Another Church: for a person who is saved, has been baptized by immersion after he was saved, and is a member in good standing of another Baptist church which will transfer him by letter to Leicester Baptist Church. By Statement of Faith: for a person who is saved and has been baptized by immersion after he was saved, but is not a member of another Baptist church. If you have questions about membership please come forward in one of our weekly services and talk with our pastor. We encourage all individuals who are interested in learning more about LBC and membership at LBC to attend our Discipleship Class on Sunday mornings at 10:00 AM. Please contact the church at (828) 515-1611 for more information.